Anodized or Digitally Printed Aluminum offer the ultimate in durability. 100% aluminum, and will outlast high temperatures, weather, chemicals and abrasions. • For Anodized Aluminum, the graphics are embedded into the pores of the aluminum, so they'll last for years. Pick from a range of adhesives, including both 3M 467MP and 468MP. • You can also use annealed anodized aluminum labels to make embossable labels. Dead soft aluminum foil allows you to make the most of your options. 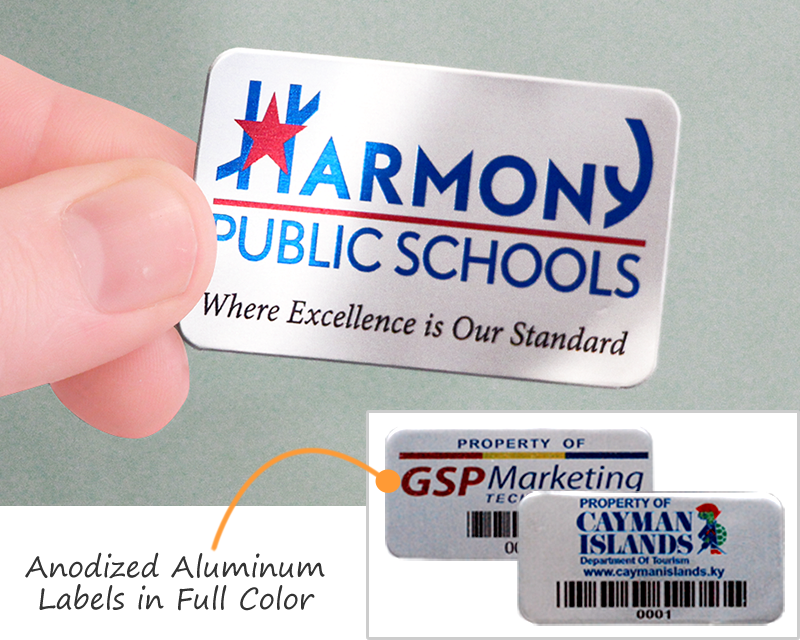 • Digitally Printed Aluminum can also accommodate consecutive numbering and full color print. Use numbers or barcodes on each label, or add your full color logo. • Superior durability. 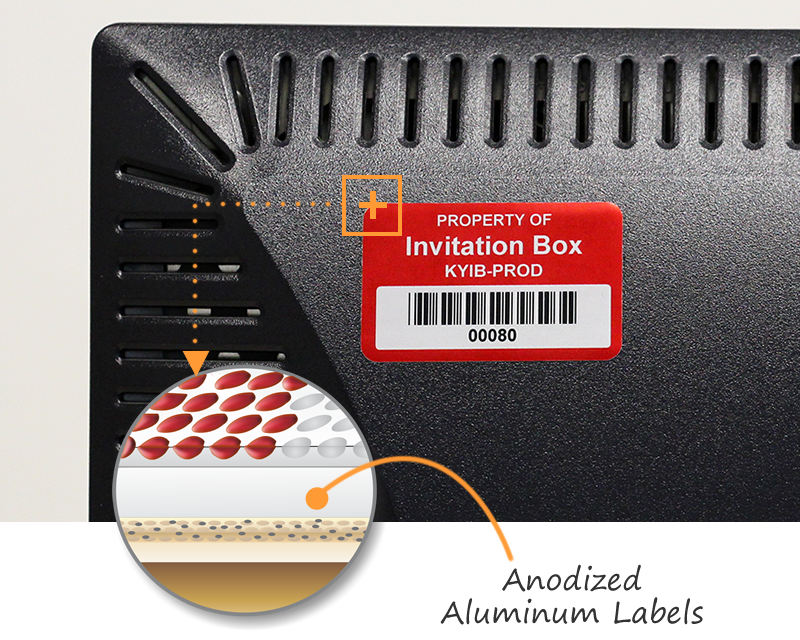 Anodized print means that your graphics are sealed into the aluminum. • Add numbers or barcodes, at no extra charge. • Choice of 3M high bond adhesives. • Easy to complete templates or upload your own design. • 20 mil or 32 mil thick anodized alumimum. • No charge for extra colors. No charge for premask. • Upload your own design or use an easy template. • Your choice of high bond 3M adhesives. 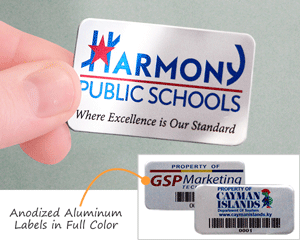 • Durable anodized print or lower cost digital print (with low minimum orders). Full color print is available at no extra charge. 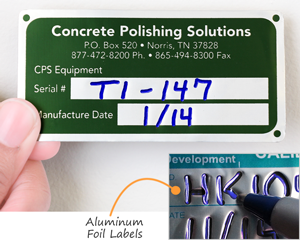 • Hand engrave your text, from the field. Writing will not wash off. 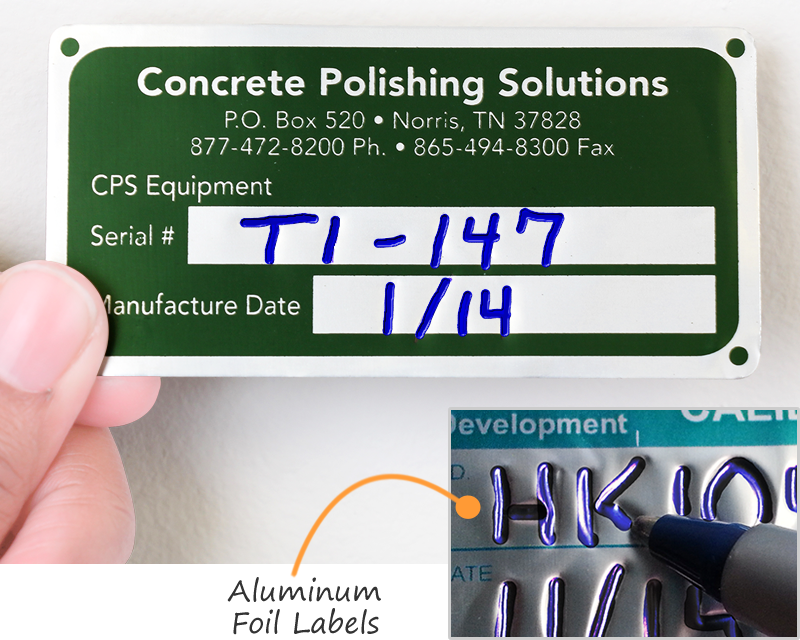 • Pliable labels conform to curved surfaces. High bond adhesives. • Resists chemical attack (superior to brass). • Custom or stock legends laser engraved into anodized aluminum. • One or two sided tags. 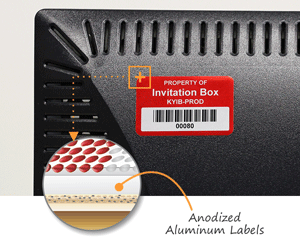 • Metallized plastic labels have look of metal – but are affordable. They have a metallic coating applied under the clear polyester film. • Low minimums (just 10 labels). • Digital, flexo or screen printed. Shiny or brushed silver finish. • Just add your text. 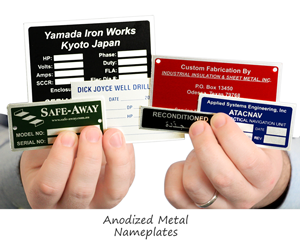 We make it easy to design your own nameplate. • Anodized aluminum outlasts abuse. • Your pick of 3M high bond adhesives.